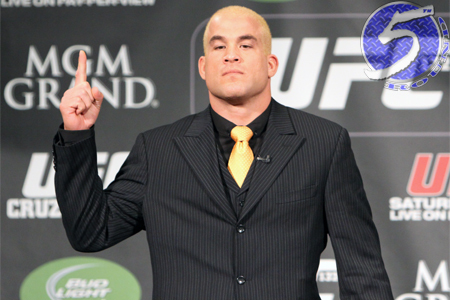 If Ronda Rousey doesn’t get the gist of Herrick’s poem, former UFC light heavyweight champ turned manager Tito Ortiz (Pictured) would like to clarify: Rousey better enjoy her UFC bantamweight crown while she can, because it will be a thing of the past once Cristiane “Cybog” Santos gets her hands on the “Rowdy” one. Of course, there’s the minor formality of Cyborg claiming she is physically unable to shed the 10 additional pounds required to drop to Rousey’s bantamweight division. While Ortiz acknowledges his client’s difficult plight, he knows the transition is not out of the question. And once they can get the former Strikeforce featherweight champ’s weight under wraps, fans can expect to see the most anticipated female fight in women’s MMA. “When I first signed her she told me, ‘I can’t go down to 135 [pounds] because I walk around at 170 – 172. As a women it’s hard to cut down. And, it sounds like a disadvantage for me to cut down so much since I am a champion fighter.’ I think it is way too soon to say and I don’t want to hurt my fighters, and she is still the champion. Cyborg’s year-long steroid suspension expired on December 17th. No word if the 27-year-old has tried to reapply for licensing. Regardless, she won’t be signed by the UFC unless she can compete in the 135-pound division. Rousey, meanwhile, makes her big league debut against Liz Carmouche at UFC 157. The February 23rd event marks the first time two ladies have headlined an Octagon show.